Keeping control of your organisations customer relationships becomes increasingly challenging as your number of customers grows. Especially mid-sized and quickly growing businesses are often losing out on sales opportunities due to a lack of oversight over their various channels. Bpm’online CRM is a CRM suite that allows businesses to tackle this problem with one central software solution: a web-based or on-premise application with three main segments covering the whole customer journey: marketing, sales and service. The browser-based dashboard is well structured and intuitive. The three “departments” are accessible through a dropdown in the menu panel and give quick access to all associated features. Additionally, bpm’online CRM offers a platform library that enables system designers and technical staff to design and implement their own interfaces with custom processes and dashboards. Besides the quick access side-panel you can also use the global search function to jump directly to any item or even call up actions like “Add Event” from the search bar, while browsing contacts. The whole suite is focused around providing your team with the tools and functionality they need to acquire, manage and support customers with the goal of increasing customer lifetime value and satisfaction. With it’s advanced capabilities but simple and intuitive interface bpm’online CRM is a solution not only targeted at larger organizations, but will also fit the needs of smaller businesses looking for a professional approach to CRM. Instead of relying on a mix of cloud-based and desktop applications, which need to be connected and updated manually, the bpm’online CRM suite offers much of the functionality needed for any business in one package. Let’s start with a review of the marketing suite – the first stage of the customer relationship. 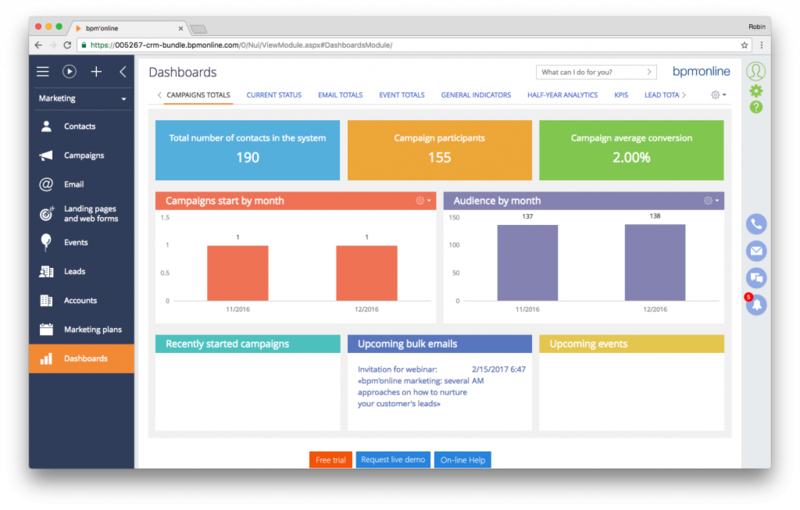 Next to the department specific dashboard (see screenshot marketing dashboard) with an overview of all running activities, the marketing suite offers functions like lead tracking for landing pages, campaign management, a contact list, email designer and an event manager. 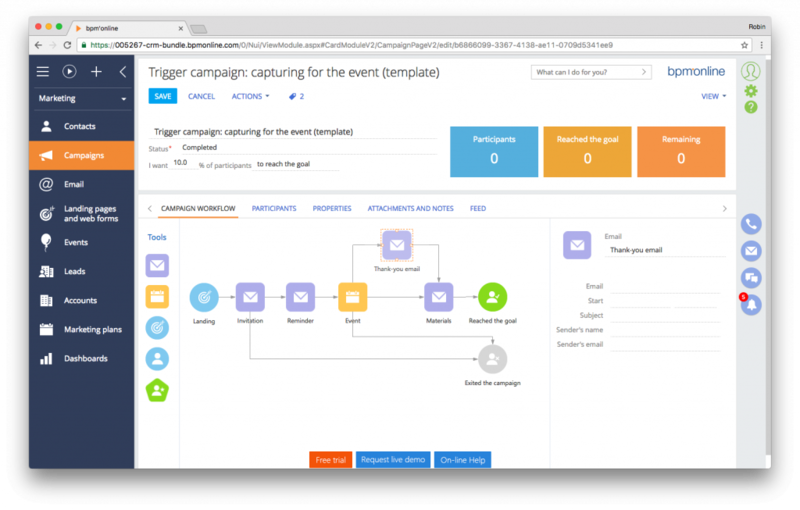 The most notable feature is the campaign function, where users can automate marketing processes in an intuitive drag-and-drop builder (see screenshot campaigns view). You can trigger emails based on various activities like a website sign-up, an event attendance or create a whole range of complex interactions. The visual workflow managers allows you to set goals, entry points, recurring events and reminders. The contacts, email, events and lead views are lists (see screenshot leads view) offering insights into key areas: you can track how many people opened an email, check on the progress of a lead or organize contacts based on smart and custom filters. Tags allow you to group and select items based on shared properties. Quick links allow you to jump from an email to the corresponding contact or lead without having to bring up the respective function. 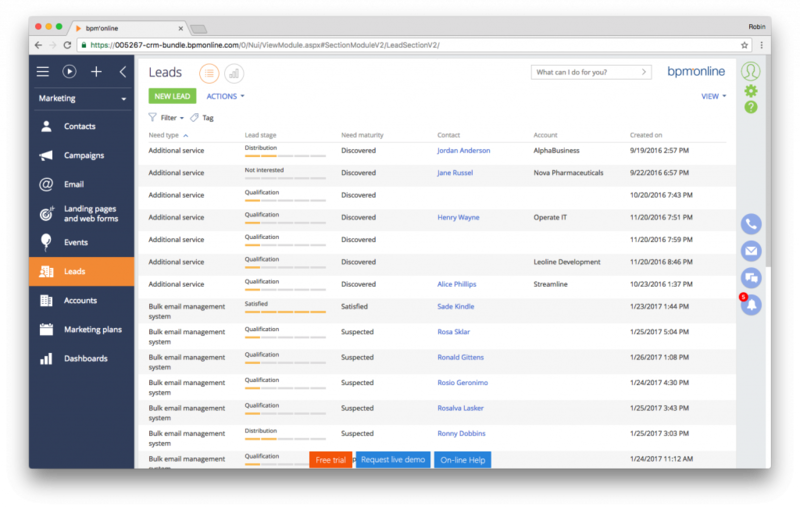 Once a lead has been qualified and handed-off to sales, the sales view allows you to manage products, orders, contacts, invoices and contracts in a similar fashion to what we have already seen in the marketing suite for emails and leads. With the data import wizard you can import large sets of product data into bpm’online CRM conveniently to move your product catalogue to the cloud. 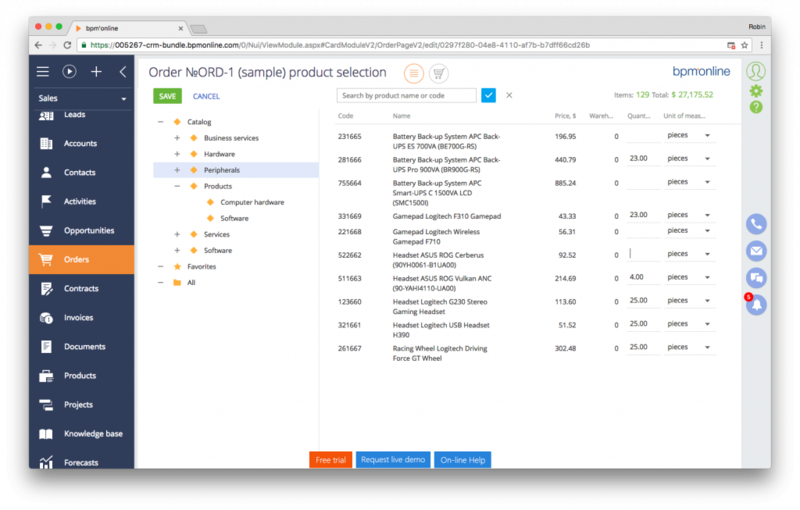 The smart lookup lets users then add products to sales via their product id, product name or by browsing the catalogue sections (see screenshot product catalogue). Most notable in this section are the sales funnel and feed, which resemble an internal social network. It shows all actions and communications between sales agents, project staff and other members of your organization involved in the closing process. Commenting, liking, sharing and tagging are all supported. You can conveniently post to this feed from virtually any area of the software – for instance, when updating a client address or when you want to inform your colleagues about a meeting you have scheduled. The “Opportunities” section allows users to analyze and track sales opportunities in the pipeline. With stage analytics and a visual representation of the overall sales activities of your team, this feature adds transparency to the sales process and helps sales managers optimize the team effort. You can compare an individual’s to the company’s overall performance and gain access to a range of other sales performance statistics. The last step in the customer journey is the after-sales service. Namely, managing customer incidents, training, up-selling and cross-selling efforts. 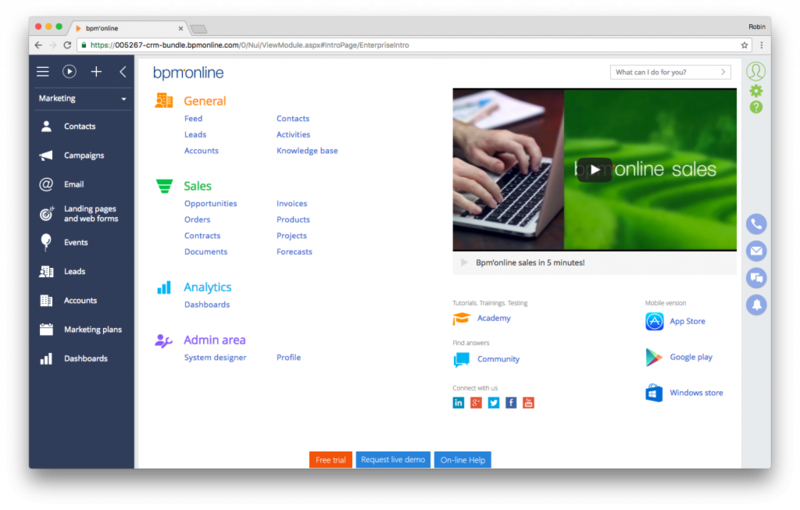 In bmp’online this section gives you access to contacts, accounts, activities, knowledge base and feed features we’re already familiar with from the sales department. Additionally, it offers access to cases, services, service agreements, configuration items, problems, changes, releases, queues and queues settings. Since the dashboards and menus are customizable, system designers can adjust this to fit virtually any service workflow. 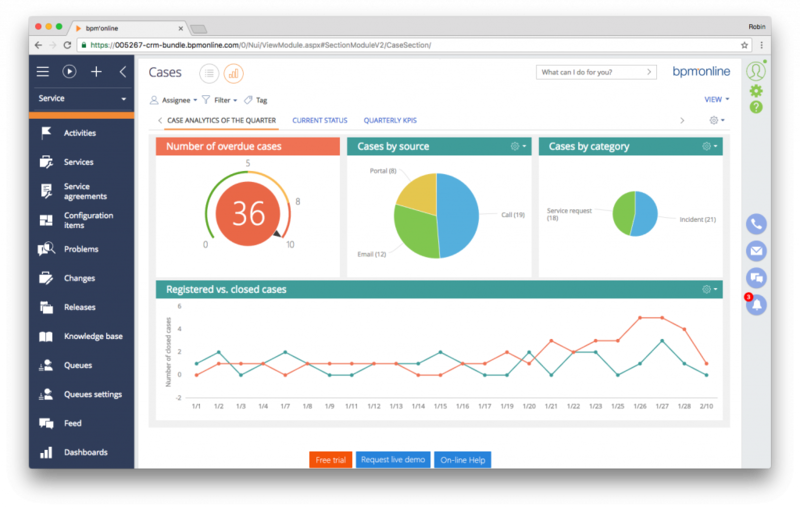 For instance, the cases section gives a list-based view of open cases, their status, the responsible person, the contact on the clients side, a category and a short description, but can be customized to reflect the exact functionality needed. The dashboard provides service managers with a visual overview of the overall state of their department, as well as track important KPIs, open cases and the work load of service staff. 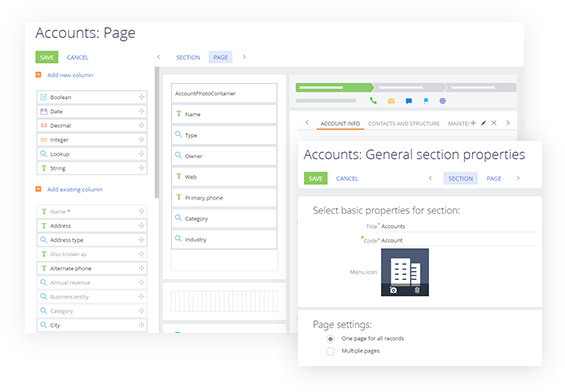 An additional feature of the suite is the business process platform, which enables users to build applications in the familiar way of drag-and-drop actions. Based on the business process modelling standard BPMN the system allows designers to customize best-practice approaches in marketing, sales and service to their business needs. Because of the standardized notation it is easy to change and edit existing processes via drag-and-drop, change parameters and create actionable automation without the need complex programming experience. The visually guided interface gives a good overview on the whole process. Logical operators direct the flow of action, which makes understanding and designing new processes easy. 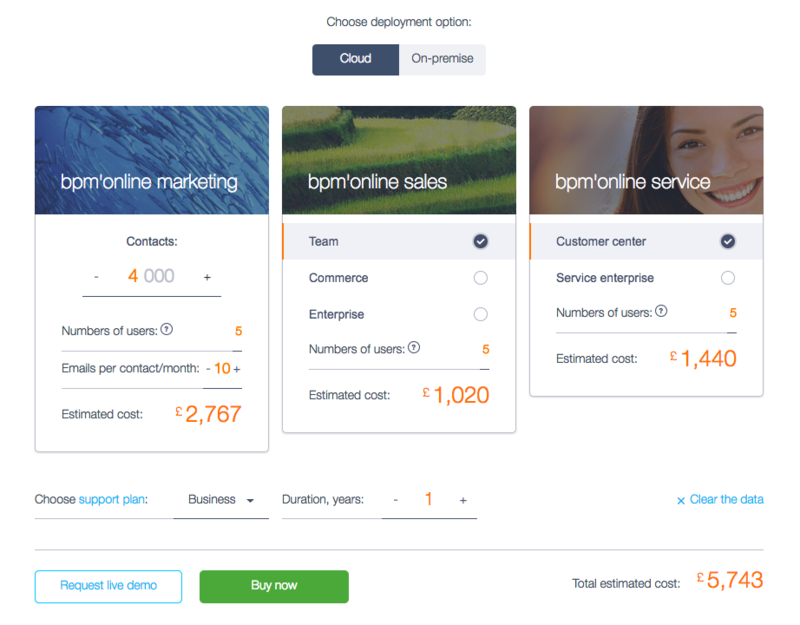 Bmp’online offers a pricing calculator that allows interested users to estimate the cost of their individual combination of the three CRM products. A small business with five people in sales & marketing, contacting around 4000 contacts per month, would pay approximately 6,000£ annually. This includes business level support and equal use of all three products. With different service levels available, the sales and service suite are adaptable to the needs of your organization and come with advanced features in the enterprise and commerce level – like the project, release, and change management or the sales forecast feature. Bpm’online CRM offers a solid stand-alone CRM solution. With the ability to import and exchange data with other applications it can also be integrated into an existing software architecture. Customizable views and a fairly intuitive setup make it easy to use. For more advanced options, custom process design and administration of the multi-user environment, bpm’online CRM offers webinars and support through their website. To find out more about bpm’online CRM visit the Crozdesk bpm’online CRM listing. 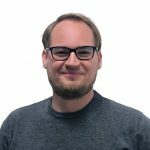 Robin is the COO of Crozdesk, focused on partnerships and process improvements. He studied IT Systems & Innovation. He’s based in London.